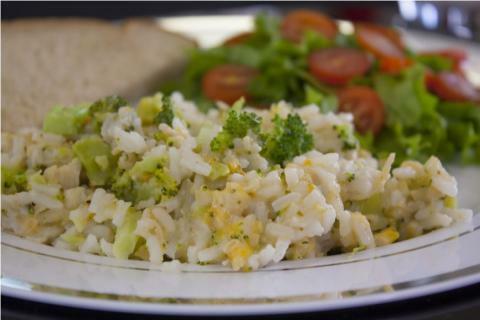 This filling rice dish loaded with chicken, broccoli, and cheese is sure to please the whole family. In 10″ non-stick skillet, heat water until it boils. Cover and cook 1-2 minutes or until water comes to a boil again. Break up any large pieces of broccoli. Add instant rice and stir well. Cover and remove pan from heat. Let stand 3 minutes. In small bowl, mix mayonnaise and yogurt. Stir well. Add mayonnaise mixture to rice and stir. Add half of cheese and all of the drained chicken. Stir. Heat on medium for 2-3 minutes until mixture is hot and bubbly and cheese is melted. Add water, broccoli, and seasoning to a 2-quart, microwave safe bowl. Heat 2 minutes. Add rice to the broccoli and stir. Let stand 5 minutes. Add mayonnaise and yogurt. Stir. Add 1/2 cheese and all of the canned chicken. Stir. Heat for 2-3 minutes, until the mixture is hot and bubbly and cheese is melted.